Protestors rally near the City of Industry to fight a government-corporate land grab in the small Mexican town of San Salvador Atenco. LA PUENTE, CA, 7 May 2006--Forty people lined the entrance road to WalMart in La Puente today, part of a trio of protests in California to end government oppression in the indigenous town of San Salvador Atenco. They were standing up against a government land grab and police brutalization in Atenco, in the state and country of Mexico nearly 1400 miles away. In all, they had broken through the mainstream media disinformation about "crazed" and "hysterical" farmers in the small flower-farming community of San Salvador Atenco, and connected the farmers' plight to globalization, land rights, and Indigenous oppression. "What's happening in Atenco is the epitome of what's been going on since 1519," one protestor explained. "We're marginalized, oppressed, forced from our land. We're in solidarity--we're part of the oppression within the history of Mexico for the past 500 years. I hold Mexico close to my heart--my grandmother speaks Nahautl. She's in the garment industry. People who want fair wages can't earn a decent living because of WalMart. Now they're adding death, blood to be shed. For 500 years, yes, that's been the history of my people." Five years ago, Mexican President Vicente Fox decided to build an airport, and he settled on some farmland around Texcoco and San Salvador Atenco. He didn't count on the ejidatarios, the communal farmers, of Atenco. They challenged the land grab in court and formed the People's Front in Defense of the Land (FPDT), but Fox pressed on with his plans. He sent in engineers, he refused to hear the ejidatarios, he promised them jobs as baggage handlers. They answered that they would rather give up their lives than the land. The FPDT reached out to farmers, workers, and students across Mexico, and protested at the Monterrey Summit on neoliberalism. They blocked the Lechería-Texcoco highway. They held engineers and, later, eleven police hostage. Frustrated by the government's refusal to back down, and faced with arrests and media coverage that characterized Atenco as a town full of crazies, thousands twice marched on Mexico City. With sparks flying as they struck the concrete sidewalks with their machetes, the FPDT finally brought international attention to their cause and pressured the government to come to the table. But Fox tried to delay and splinter the famers. Then on July 24, 2002, the day negotiations were set to begin, Jose Enrique Espinoza Juarez, an Atenco protestor, died in police custody two weeks after police beat him and refused him medical attention. Church bells announced his death and warned the women of Atenco, who dragged rocks to barricade the roads into town from police while the men returned from the fields. Two FPDT leaders, Ignacio del Valle and Adan Espinoza were brutalized and arrested. But the Atenco farmers had forced the government into negotiations. At the table, the Fox government was confronted with ejidatarios proclaiming that they would not sell their mother earth, and others outside chanting, "if there’s no solution, there’ll be a revolution." On August 6, 2002, Fox officially rescinded the expropriation order, and the people of Atenco, following the Zapatistas' lead, declared themselves an autonomous municipality, banning police and government officials from the town. Vicente Fox had suffered a humiliating defeat. Today, four years later and two months before the Mexican Presidential elections, the police once again attacked the farmers of the Atenco region, and once again, land was the issue. "Some people may not see the direct connection," the protestor added, "but whether we're aware of it, it's a direct result of colonization." "Zapatistas are heroes of our people, taking arms. That's bold and inspiring. We need our own Zapatistas here--we need to create our own liberation movement. It's time in Los Angeles, in Orange County, in California, in the so-called 'United States.' It's great to support the Zapatista movement, but I'm not here to support the Zapatistas--this is our movement, the Indigenous Movement. ¡Que viva agrarian reform! Viva the Indigenous Movement!" An SUV driver waved off an English-language flyer and shouted back, "I don't speak Spanish! I don't speak Spanish!" "What's the use of cars?" a Mexican protestor asked. "BMW's are for status. What matters is land." "We're here because of the transnational minimum salary. Food is cheaper here than in Mexico. Seventy percent of what California produces goes to Mexico," he added. "They take the land on the coasts, the fishermen's land, for tourist hotels. There's a lot of immigration for that reason. All the money and industry is from foreign countries. Mexican oil and mines are sold to foreign countries. Do you know about Article 27?" he asked. Article 27 was a part of the Mexican Constitution that Emiliano Zapata had demanded. It prohibited the sale of Mexican land to foreign nationals. It had to be rescinded in 1992 in order to comply with NAFTA. "They use the Mexican people to build things cheaper. Pretty soon the people in the United States will have the same problem--they're cutting workers here. You can read it in the paper every week--500, 1000 laid off." He speculated, "If you wanted to change Mexico, the United States will send in military equipment and tell us its to keep Mexico from becoming communist. We just want to be free." Back to his bottom line, he went on, "The most important thing for all people--the rich, the poor--is the land. Without food . . . ." He raised his eyebrows and shrugged. He resumed. "I'm here to tell people what's happening. Ninety percent of the people don't have time to read--the father, the mother, the children work. And the television tells us what the government wants us to hear." Will a new President in Mexico make a difference? "No, I don't think so. If the government was working for the country, we wouldn't be here." He glanced at WalMart. "Mexico is very rich. The people are working so the government stays in power. The government demands money, and more money." "Is this about the EZLN?" I asked another rallier, recalling May 3rd's red alert. He answered, "This is an attack on La Otra campaña, as well as the farmers. The attack on San Salvador Atenco came right after Subcomandante Marcos left there. I assume that the Mexican government reacted to crush La Otra campaña to make others afraid to participate, by making an example out of the people of Atenco." "To attempt to crush La Otra campaña and its Indigenous supporters in Atenco is to attempt to crush the Zapatistas, the Mayan Indians, and, by extension, Mother Earth," he explained. "The Indigenous people are the guardians and caretakers of Mother Earth. In attacking Atenco, they're attacking all that. They're trying to crush the hopes of all the people of Mexico and the many people around the world who are inspired by the Zapatistas." "Why are you here?" I prodded. "I'm here because 'Todos somos Ramona y todos somos Marcos, y cuando estamos presente son presente.'" "They want to keep revolutionary politics away from the people of Mexico just like they want to keep revolutionary politics away from the migrant movement here," he concluded. Presidente Fox appropriates 5000 hectares from the ejido communally-held lands of Texcoco and San Salvador Atenco for an airport. He promises them jobs as The ejidatarios refuse to give up their land and organize as the People's Front in Defense of the Land (FPDT). After nine months of protests and court appeals, the police arrest two and the ejidatarios take fourteen hostages and raise blockades, brandishing now-famous machetes. The government backs down. Police and officials prevent the farmers from selling their flowers at market, citing license violations. The Belisario Domínguez market is scheduled for conversion to a shopping center, likely to include a WalMart. Eight hundred riot police storm the market, attacking young and old alike. Guns are poised against machetes, and arrests begin. 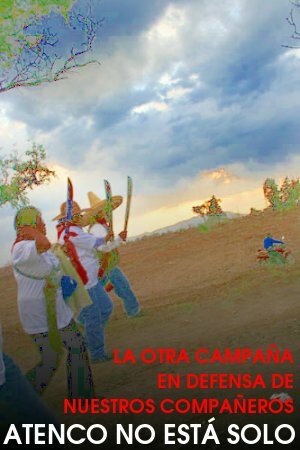 Atenco's FPDT welcomes the EZLN's La Otra campaña, an alternative to Mexico's capitalist political parties, to Atenco. Subcommandante Marcos, Delegate Zero of the EZLN, marches with supporters and students to the U.S. Embassy in Mexico City in support of the U.S. migrant boycott and marches. His security escorts are from Atenco. Police storm Texcoco, confronting women and men armed with machetes. One hundred are arrested, including FPDT leader Ignacio del Valle as he calls for dialog. Del Valle is photographed with blood on his head and groin area. Fourteen-year-old Javier Cortés Santiago is shot to death. The EZLN declares a red alert and suspends La Otra campaña. The EZLN calls for blockades in the streets of Atenco and other peaceful disobedience, and offers to aid those the town. The FPDT demands unconditional liberty for those who have been arrested and the withdrawal of all police forces. Twenty-three hundred police enter Atenco and the surrounding area, with continued beatings, rapes, and arrests. FPDT blocks the Lechería-Texcoco highway and calls on the EZLN for mobilization. Protests in support of the FPDT are announced for New York, Los Angeles, Boston, Houston, and San Francisco. Delegate Zero leads up to 6000 supporters in a 6-mile march to Atenco, and vows to remain in the police-controlled town until the conflict is resolved and the prisoners are released. Prisoners begin a hunger strike led by Gloria Arenas Ajís, who calls for the release of all political prisoners, the revocation of all warrants, and an end to the persecution of América del Valle and her family. A National Assembly Against Oppression meets in Atenco and forms a plan of action, including flyering to counteract media disinformation, road blocks, a voluntary strike, marches, and a call to purchase May 10 Mother's Day flowers in Atenco. Thus far, the residents of Atenco report over 400 arrests, 18 disappeared, and 5 rapes by police. See Narco News for details and continuing coverage of events in Atenco.